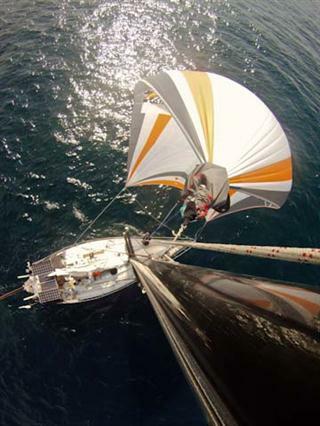 Gudrun V in the Pacific, with Parasailor up. The first unexpected thing that happened yesterday afternoon was that the wind died at 4:30pm, two hours earlier than the days before. Doesn't matter, it will be back. We had nice dinner in the cockpit (wraps), watched a pod of dolphins go past, then a flock of birds on their migration go the other way. It's surprising how much live you actually see in the middle of the ocean, when you just sit on one spot for a while. Actually pretty busy out here. We felt happy and privileged and mixed some Gin Tonics and toasted to the great trip so far, and the fact that we were more than half of the way to the Galapagos already. The dreaded doldrums experience of sitting in the heat for days without end and no wind wasn't happening. Then an hour later the banging started. Big waves against the back, rocking and rolling the boat in a dead calm. So somewhere there must be wind, only not here. Somewhere there was a lot of wind, and apparently all night because the banging and rolling just wouldn't stop. At four in the morning I saw another light on the horizon, and since it didn't move it was either a star or another sailboat drifting. Two hours later it was still there, so it must be another sailboat. Cool. Guess what happened in the morning? Nothing. No wind. Not even after the sun was up. 9:00am and still no wind. I downloaded some grib files. Not good, the files said there would be no wind all week. I told Liz, and she screamed "Doldrums! ", and smiled her big happy smile. Then she thoroughly enjoyed herself sitting in the calm (the banging and rolling had stopped after 14h), watching the sea and the sun and reading. But after 18h drifting I was antsy to get on. As Captain I felt responsible to get my boat and 'crew' to our destination. And we had to meet Andre and his family, who had to leave the Galapagos soon, because his Visa would run out next week. Therefor sitting around for a week and not getting there wasn't what I had in mind. Liz wanted another hour of peace an quiet, and I was happy to wait for some wind as well. When it wasn't there by 10:00 I started the engine (with the newly repaired starter motor). It started immediately, and smiling happyly I climbed into the cockpit to engage the autopilot etc. Then the engine stopped. Surprise! I tried to start it again, and it turned and turned but didn't fire. Thoughts: can only be air or fuel. I opened my "Marine Diesel Engines" book and called my brother anyway to get his opinion before I go chasing in the wrong direction. Yep, air or fuel, but probably fuel. Four hours later the problem was resolved: it was related to fuel. And air, in a way, as well. The banging and rolling had pushed water into the hose for the fuel tank vent, which is connected to the bilge drain hose. That prevented fuel from getting out of the tank because no air could come. But not before the dirt of 30 years had filled the (20 engine hour old) primary fuel filter. Resolution: drain dirty fuel from the bottom of the tank, clean all hoses, replace all filters, empty the vent hose and run it in a high arc so that it can't happen again. Busy, busy. Fortunately I carry a set of spare filters. And lots of zip ties! And even more fortunately wind had finally arrived and we were moving along at 4kn without much rolling. I still managed to hit my head on the aluminium frame :-). Now I have to get rid of a big back of diesel-soaked paper towels. Maybe burn them in the bbq? All is well that ends well. Especially since we're now sailing along with 6kn, direct course to the Galapagos. The grib files were completely wrong the last days, wind came from SE when it should come from NE, and it was calm when it shouldn't etc. So the best bet is to go the fastest course towards the destination when there's wind, and hope that the periods of calm aren't too long. Next calm we'll start the engine for a few hours and motor. I want to make sure everything is really working before we enter Academy bay and need the engine, and the batteries and water tanks could use a charge as well.